The video below shows the use of KNIME for handling data (reading data from a flat file and/or a database) as well as model building (data massaging and training a neural network). It also highlights how easy and straightforward it is to move a predictive model represented in PMML, the Predictive Model Markup Language, into the Zementis ADAPA Scoring Engine. ADAPA is then used for model deployment and scoring. PMML is the de facto standard to represent data mining models. It allows for predictive models to be moved between applications and systems without the need for model re-coding. When training a model, scientists rely on historical data, but when using the model on a regular basis, the model is moved or deployed in production where it presented with new data. ADAPA provides a scalable and blazing fast scoring engine for models in production. And, although KNIME data mining nodes are typically used by scientists to build models, its database and REST nodes nodes can simply be used to create a flow for reading data from a database (MySQL, SQL Server, Oracle, ...) and passing it for scoring in ADAPA via its REST API. Read data from a flat file, use KNIME for data pre-processing and building of a neural network model. Export the entire predictive workflow as a PMML file and then take this PMML file and upload and score it in ADAPA via its Admin Web Console. Read data from a database (MySQL, SQLServer, Oracle, ...), build model in KNIME, export model as a PMML file and deploy it in ADAPA using its REST API. This use-case also shows new or testing data flowing from the database and into ADAPA for scoring via a sequence of KNIME nodes. The video also shows a case in which one can use KNIME nodes to simply read a PMML file produced in any PMML-compliant data mining tool (R, SAS EM, SPSS, ...), upload it in ADAPA using the REST API and score new data from MySQL in ADAPA also through the REST interface. 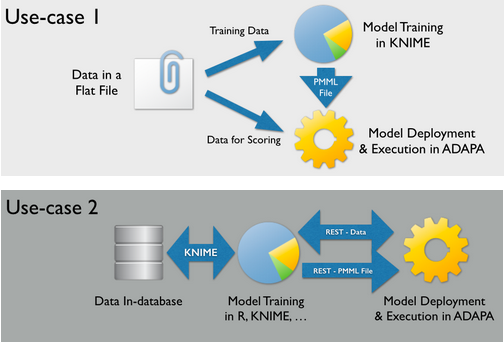 Note that in this case, the model has already been trained and we are just using KNIME to deploy the existing PMML file in ADAPA for scoring.